from as far away as Sweden were treated to several fascinating research presentations over the weekend. Along with Special Guest Speaker, Pierre Pilote, two local and well-known PSHOF Inductees, Larry Bellisle and Mike Dubeau were also on hand and were asked to speak to the group at their “Meet and Greet” session which was held on Friday evening. By all accounts the 2014 SIHR Annual Meeting was considered to be a highly successful event and kudos go out to Waxy and his PSHOF team of David Dupuis and Larry Lalonde for a job well done! All that attended this years Fish Fry were delighted with the spectacular food and talent. Buzz Deschamps was at his usual best as master of ceremony. Jack Valiquette surprised the crowd with his whit and sense of dry humour. Both Buzz and Jack had everyone in stitches the whole evening. Many thanks to all involved from the committee to volunteers.See you in all again in 2 years. 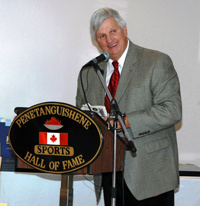 Penetanguishene Sports Hall of Fame's 2013 inductions are in the books. For Glenn Howard, Jeff Gignac and the members of the 1974 Penetanguishene Secondary School junior boys football team, it was an evening to remember. 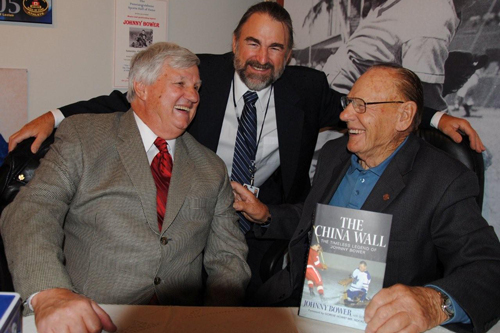 PSHOF's inductees were applauded by more than 350 people who attended the dinner and induction ceremony on Saturday October 27 2013, in the Brian Orser Hall at the Penetanguishene Memorial Community Centre. "Babe, The Peerless Pitcher from Penetanguishene, Penetang Phil, Fidgety Phil. If you were around back in the 1930’s, 40’s and even the 50’s, all you had to do was hear one of those nicknames and you knew who people were talking about. Even today the townsfolk still recognize the monikers..." Click here to read full story. June 11th, 2011 - The Penetanguishene Sports Hall of Fame is proud to announce four new inductees to its ranks: two builders and two athletes, to be enshrined at its 13th Induction Dinner and Ceremony slated for October 1st 2011 in the Brian Orser Hall. The committee received seven nomination packages from the general public by our May 31st deadline and all were well done. They gave the PSHOF committee great portraits of the nominees and invaluable historical information about them and their sport’s contribution. All nominators should be applauded for their fine efforts. The 2011 field of nominees are exceptional and indicate a rich and varied array of sporting life and accomplishments in and from Penetanguishene and area. Amazingly, all were not born here, but moved here and left their mark! 1- Larry Banks, nominated by Jacquie Robson, was born in Halifax, Nova Scotia, moved to and played minor hockey in Elmira, Ontario before coming to Penetanguishene as a young Phys-Ed teacher in 1970 at Penetanguishene Secondary School alongside another PSHOF Inductee, Mate Lichtenberg. Larry’s excellent coaching skills soon brought championships to PSS in football, hockey and track & field over his 17 year career. He was instrumental in organizing the first of many CKMP Track and Field Meets for local high schools. He was an avid supporter of local hockey, was on the Penetanguishene Minor Hockey executive for numerous years and ran many hockey and coaching clinics in the area throughout the 1970s and 80s. He was also a member of the Penetang Brulé Garrisons Intermediate “C” hockey team. In 1973, he established the Penetang-Midland Touch Football League which is still running! 2- Doug Mundy, nominated by Gilles Charlebois and the Penetanguishene Recreational Hockey League, was born in Brantford, Ont. and he moved to Penetanguishene in 1967 to teach at PSS. He immediately joined the executive of the Little NHL in Penetanguishene, coaching and being involved extensively for 20 years. He was voted “Mr. Hockey” in 1972, and won the CKMP Coach of the Year Award in 1974. 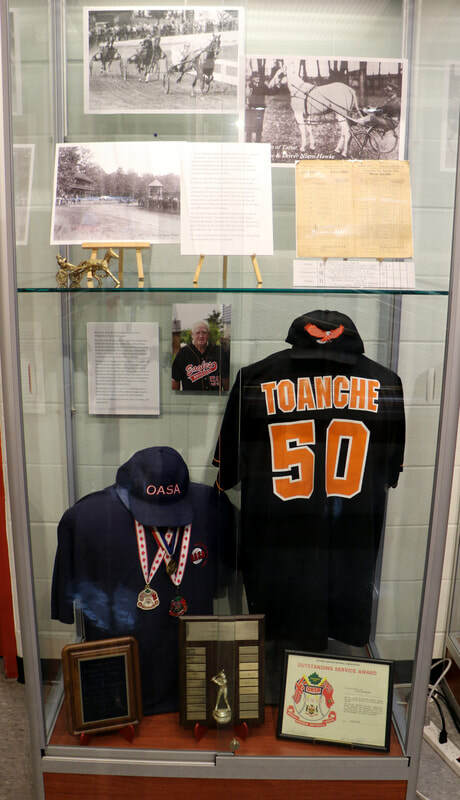 He was an instrumental executive member, secretary, treasurer and fundraiser with the Penetanguishene Sports Hall of Fame committee from 1995 until 2006. He was also a minor baseball coach in town and a basketball coach at PSS. Since 1989, he has been timekeeper, statistician, publicity director, treasurer, secretary and Executive Director of the men’s Rec Hockey League, and he is still going! 3- Edmund Desrochers Jr., nominated by Madeline Twitchin, was born in Welland, Ontario, but moved to Penetanguishene in 1944. He soon took up the sport of boxing at the age of 14 when he hung a punching bag in the family barn. As an amateur he won several bouts, winning The Armand Trophy in 1960, The G.H. Wells Trophy and the Northern Ontario Championship in 1961. He signed a professional contract with boxing manager John Duncan in 1962 and later that year he won the Buffalo Boys Town Golden Gloves Championship at Madison Square Gardens in New York. In 1964, he was on the preliminary boxing card at Maple Leaf Gardens of the first Cassius Clay-Sonny Liston fight broadcast from Miami. Edmund, a hard puncher, was “born to be a boxer”, but without proper training and a good manager, he retired from boxing at 26 years of age. 4- Chris Kontos, nominated by Dave Young and Stan LeClair, was born in Toronto but his family moved to the Waubashene area where he played minor hockey in Coldwater. He moved up to play junior hockey for the Sudbury Wolves and the Jr A Toronto Marlboros. He played for the NHL Pittsburgh Penguins and the Los Angeles Kings before joining the Tampa Bay Lightning in their inaugural season in 1992. This same year he moved his young family to Penetanguishene while toiling for the Lightning. In 1993, he played for the Canadian National Team when they won Silver in Lillehammer, Norway and was escorted down the Main St. on the town fire truck. He would play with the Nationals again the following season. He also played for the IHL Cincinnati Cyclones, Quebec Rafales and the Manitoba Moose. He retired home to Penetanguishene after the 1997-98 season with the Revier Lions of the DEL. 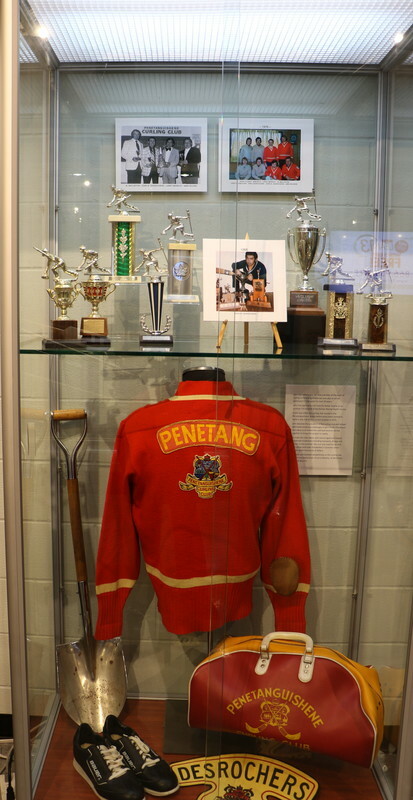 The PSHOF now boasts 177 individuals amongst: 64 Inductees made up of, 30 Athletes, 9 Teams and 25 Builders, representing 18 different sports: hockey, track & field, soccer, wrestling, football, tennis, baseball, ball hockey, softball, karate, horse racing, curling, figure skating, golf, swimming, bowling, boxing and volleyball! The 2011 PSHOF Induction Dinner & Ceremony will take place on Saturday, October 1st, 2011 at the Brian Orser Hall. The tickets will be available towards the end of the summer. It promises to be a historical evening and tickets will be in great demand as seating will be limited. Further details to follow. Barbe and Marilynne manage the PSHOF booth at the Penetanguishene Mall during Winterama weekend. PSHOF accepts the torch carried by Wendy Cousineau and donated to the Hall with support of the Town of Penetanguishene. February 2010 - Buzzy inducted to Suffolk Sports Hall of Fame. Click in image to view full pdf news release. 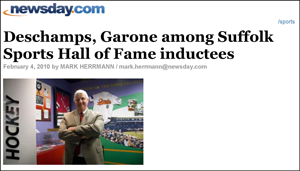 The 2009 PSHOF Induction Dinner Celebration was another huge success. Buzzy Deschamp was an outstanding MC along with a number of special guests including Johnny Bower as seen here sharing a moment with Buzzy and Waxy. 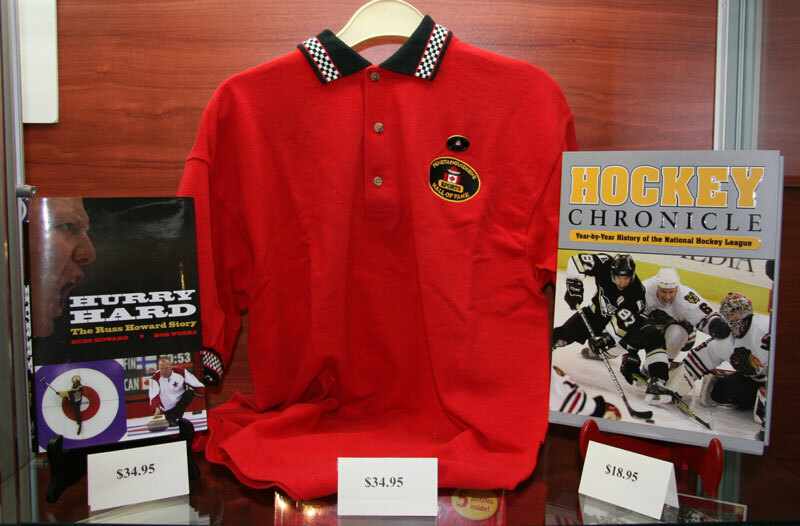 PSHOF offers a variety of products for sale. Please visit or click on image to view some of our products for sale in our Gift Shop.